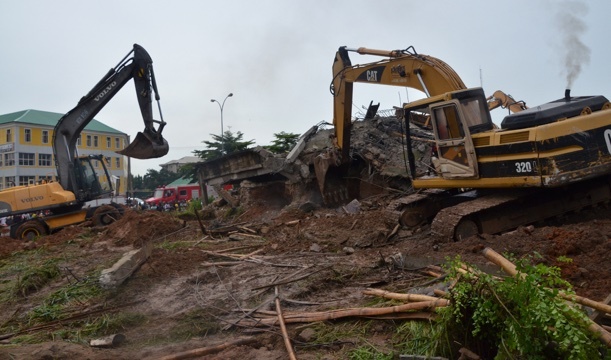 A three-storey building under construction collapsed in the Jabi area of the Federal Capital Territory on Friday afternoon. Sadly one person died, and according to Punch, 25 others were trapped. Officials later rescued 6 persons and evacuated the deceased. Rescue operations are ongoing. Acting president Yemi Osinbajo, accompanied by FCT minister Muhammad Bello and SGF Boss Mustapha visited the scene of the incident. Pic.17. 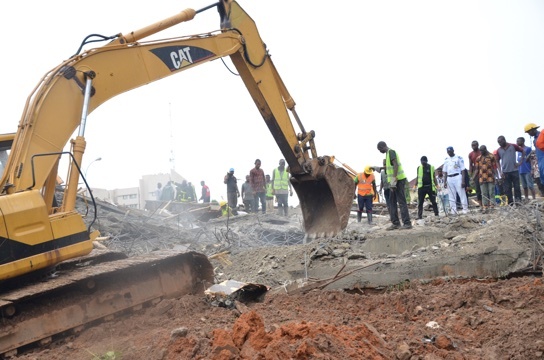 On-going rescue operations at the scence of building Collapse at Jabi in Abuja on Friday (17/8/18). The collapse of this building is a very unfortunate incident. As you know, it was a building under construction. It appears to have collapsed a few hours ago. The most important thing at the moment is that we have all of the relief, safety and emergency management agencies all here. NEMA is here, the FCT authorities are here, the Hon. Minister himself is here, the executive government is here. So, the whole process of ensuring that those who may be trapped under this collapsed building are rescued is well underway. All of the emergency equipment, help movers and the equipment that are required, are here. Pic.18. On-going rescue operations at the scence of building Collapse at Jabi in Abuja on Friday (17/8/18). This evening, I visited the site of the building that collapsed in Abuja. My heart goes out to the family that lost someone today. There are no words to describe how you must be feeling. On behalf of this nation, please accept our sincere condolences. To all of the people who were injured, we wish you speedy recovery. Thank you to officials of the FCT Fire Service and NEMA for conducting rescue operations quickly. Your actions saved lives today, thank you so very much.